Olympiacos Piraeus used a great defensive effort to take a huge step towards a place in the Top 16 with a 75-53 win over Anadolu Efes Istanbul at the Peace and Friendship Stadium on Thursday night. The win lifts the reigning Turkish Airlines Euroleague champions into a sole possession of second place in Group C with 5-2 record, while Efes dropped to 4-3 and into third place. Efes, however, managed to preserve the hold of a potential tiebreaker over Olympiacos as the 22-point loss is a smaller deficit that its win over the Reds in Istanbul. Olympiacos allowed only 1 field goal and a total of 6 points in the second quarter to open up a double-digit lead, and then used a 21-4 third quarter run to seal the deal. 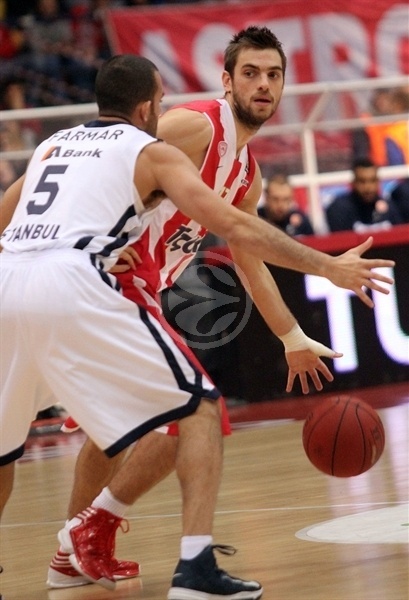 Kostas Papanikolaou led victors with 17 points, Vassilis Spanoulis scored 14 and Acie Law chipped in with 10 points. Jamon Lucas was the lone Efes scorer in double figures with 15 points, while Sasha Vujacic and Semih Erden each scored 8. 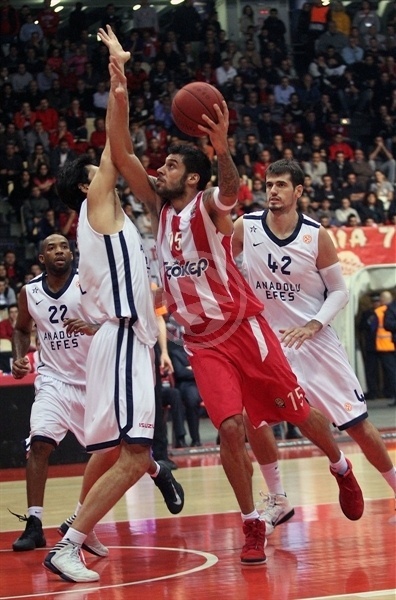 Erden also grabbed 10 rebounds in defeat. Jordan Farmar opened the game with a jumper and a fastbreak layup before Vassilis Spanoulis hit a triple to open Olympiacos’s account. 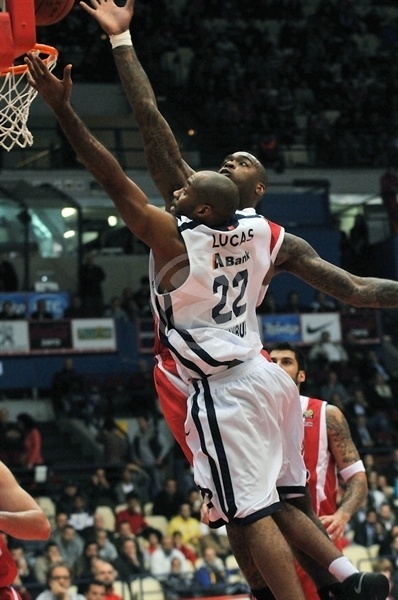 Erden added a dunk for Efes before a basket-plus foul from Georgios Printezis gave the hosts 8-6 advantage. The visitors answered with couple of layups from Lucas, and Erden scored inside to complete a 0-7 run. Papanikolaou hit a triple from the right corner to keep the hosts close, but Kerem Gonlum, Lucas and Farmar all scored inside to maintain the lead for Efes. 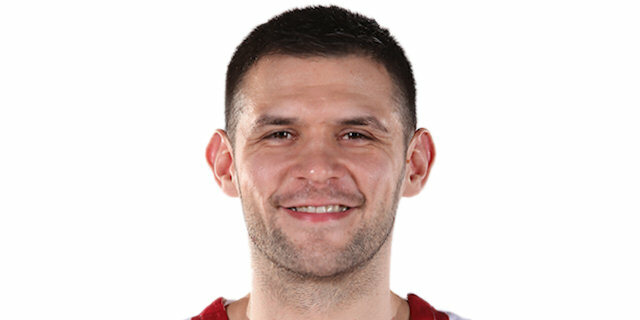 However, Papanikolaou’s layup-plus foul sparked an 8-0 run capped with a reverse layup from Kyle Hines and Olympiacos held 23-20 lead after the first quarter. Pero Antic extended the advantage to 6 points with a triple on the opening possession of the second quarter, but it turned out to be the lone field goal in the first four minutes of the quarter. Stratos Perperoglou ended the drought with couple of layups and Spanoulis hit a runner for 32-21. Efes continued with offensive struggles as it was held to a single free throw made for over eight minutes. A Spanoulis layup made it a 14-point game before Erden and Vujacic made 3 of 4 from the foul line, however Olympiacos did not allow a single field goal in the quarter until Lucas made a floater with 0.4 seconds remaining, making it 35-26 at the half. Vujacic hit a triple to get Efes going in the third quarter while Printezis drove for a dunk on the other end. Gonlum cut it to 37-33 but Papanikolaou hit a triple and Spanoulis made layup to keep visitors at distance. Run continued with Acie Law converting a fast break, while Papanikolaou hit a triple to extend lead back into double figures, 51-35. Visitors ended their their 4-minute drought with a layup from Ermal Kuqo, but Kostas Sloukas made a layup and Papanikolaou hit his fourth triple of the game for 58-37. Jamon Lukas answered with a triple and a pair of free throws to cut the deficit to 59-42 going into the final 10 minutes. 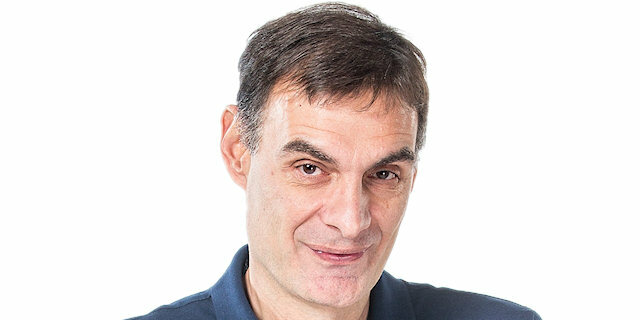 Perperoglou scored a layup to open the fourth quarter and after Sloukas added a jumper, Perperoglou sank a triple to make it a 24-point game, 66-42. The defense of the hosts was at it again, holding Efes without a field goal for more than four minutes until Sinan Guler made a layup for his first points of the game. 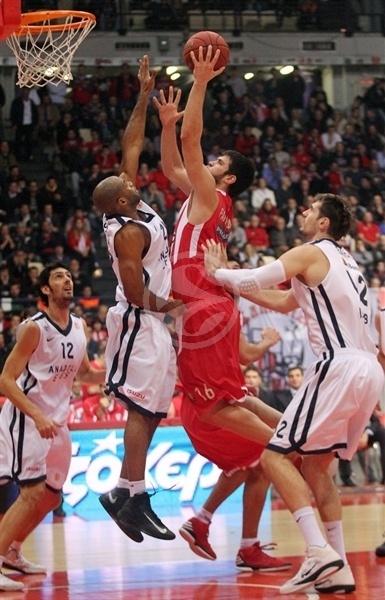 With each basket important because of the potential tiebreaker, Olympiacos was not going to let down. Law scored a layup before the teams exchanged shots from the foul line. 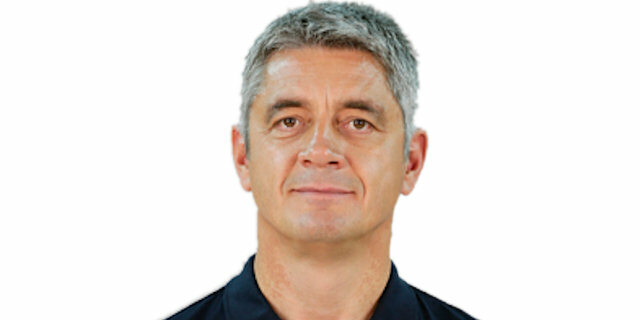 Hines made a basket-plus-foul getting the margin back to 24 points, however Dusko Savanovic answered with a jumper and made a layup with 16 seconds to go making it a 22-point game and preserving for Efes a hold of a potential tiebreaker. "The level of the competition is extremely high and if you play bad, you can lose by many points, as happened in Istanbul. Compared to the game we played one month ago there, tonight was another story. I never underrate a victory, no matter if it is a 22-point win over Anadolu Efes or just 2 points over Cedevita. Tonight we played great in defense and we didn’t allow our opponents to score easily as it has happened in the first leg, especially from the three-point range and in the transition game. Tonight we approached correctly the needs of the game and got an emphatic victory, although we didn’t shine on offense." "First of all congratulations to Olympiacos for their win. We had a good start in the game, but then we made a lot of mistakes and I also think that the technical foul called against us changed the balance. We have absolute respect for Olympiacos, but I have to say that tonight we played a very bad game because of several reasons. We emphasized the shooting, didn’t use our inside game and didn’t search for alternatives on offense. In a fight between two eggs, one will be broken. 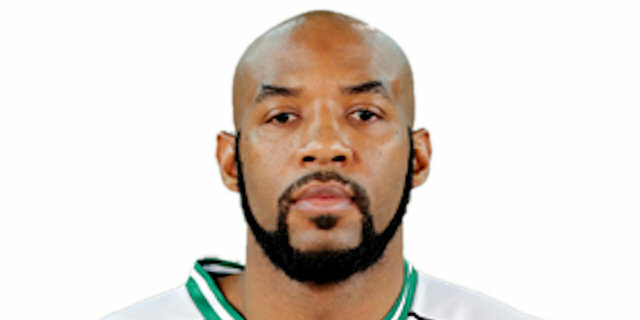 I think that both results in the games between Anadolu Efes and Olympiacos are not realistic." "Anadolu Efes is a very good team, but tonight it was our turn to show a great performance and get an impressive win. We came very close to overcoming the 26-point deficit from the first game and it would have been an unbelievable feat. To be honest, if somebody said that we could beat them by 27 points, he looked like crazy. The positive thing for Olympiacos is that we are now playing in a standard rhythm and prove our potential. My high percentage from the three-point range is just a matter of hard work in practice, concentration and good psychology. " "Our defense was definitely the key for this win. We managed to control the rhythm of the game and didn’t allow our opponents to score easy points. I am still learning things here and I have been surprised because my team lost in Istanbul by 26 points, but tonight we beat them by 22. The goal is to improve in every game." "They destroyed us with their defense. Olympiacos played in that end of the court and they didn't let us to have our rhythm. Fortunately we didn't lose the deficit from the first game, but it doesn't matter. We have to study that game and find the reason of the problem."